The police today detained at least 250 persons in raids on militant Islamic groups that had failed to comply with a ban on raising funds for jehad. A senior police official said the raids netted more than 200 activists, at least 700 collection boxes, some weapons and a number of signboards promoting jehad. At least four Palestinians were killed early today in a clash with the Israeli army northwest of Nablus, a hospital source said. 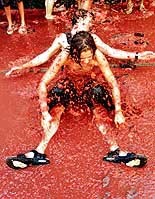 Revellers splash tomato pulp after the annual Tomatina (tomato fight) in the Mediterranean village of Bunyol, near Valencia, on Wednesday. Tens of thousands of revellers pelted each other with tonnes of ripe tomatoes during one of Spain's oddest fiestas and the world's biggest tomato fight. NATO governments today approved plans to send thousands of troops to collect weapons from ethnic Albanian rebels in Macedonia, launching the alliance’s third Balkans mission in a decade. 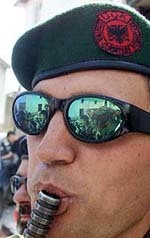 An NLA rebel soldier pretends to blow on his machine gun like a flute at the village of Sipkovica on Wednesday. NATO governments approved a plan on Wednesday to send thousands of troops to collect rebel arms in Macedonia. Iran’s Parliament (Majlis) today approved all 20 ministers nominated by President Mohammad Khatami, ending a row in which reformist MPs had threatened to use their majority in the assembly to reject some Cabinet members. 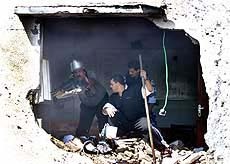 Palestinian security men and firemen inspect damage to a police station after two Israel surface-to-surface missiles hit the station at Khan Younis south of Gaza Strip on Wednesday. Reflecting a hardening of stand on the NMD, the USA today set November as the deadline for Russia to agree to the changes in the ABM treaty as sought by Washington or face unilateral US withdrawal from the 1972 accord. Russia said on Wednesday the army had wounded the country’s most wanted man and killed more than 35 other rebels in Chechnya, while a separatist website insisted more than 40 Russians had died in fierce fighting. Concerned over ruling Taliban’s destruction of Bamiyan Buddhas early this year, Unesco has, for the first time, decided to engage the Islamic militia as part of its efforts to protect remaining cultural heritage in Afghanistan. The US debt to the United Nations has reached a record high of $ 2.33 billion as of July 31, the world body reported. About $ 1.8 billion of the total is for peacekeeping missions for 2001 and in past years. The balance is Washington’s share of the UN’s regular $ 1.1 billion annual administrative budget, UN spokesman Fred Eckhard said. The police today detained at least 250 persons in raids on militant Islamic groups that had failed to comply with a ban on raising funds for jehad. A senior police official said the raids netted more than 200 activists, at least 700 collection boxes, some weapons and a number of signboards promoting jehad. Deputy leader of the Al-Badr Kashmiri militant group Ahmad Hamza speaks to reporters during a news conference in Rawalpindi on Tuesday. He condemned the ban by the Pakistan government from displaying signboards and publicly raising cash to fund jihad, or Muslim holy war, in Pakistan and abroad. “We gave them 24 hours to comply with the order issued by the Sindh government and after the expiry of that time limit, detentions were made for defying the government ban,” he said. A Sindh provincial government order on banning militant Islamist groups from displaying signboards and publicly raising jehad funds took effect from Tuesday. The order warned militant groups that “any deviation from this order will be seriously viewed by the government and appropriate action shall be initiated against the offenders”. The order covers all jehadi groups, including those operating in Indian-controlled Kashmir where more than 12 guerrilla organisations are fighting New Delhi’s rule. 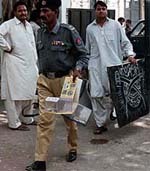 The police said the offices of Al-Badar Mujahideen, Lashkar-e-Toiba and Jaish-e-Mohammad were sealed after the raids. Al-Badar Mujahideen, one of the groups fighting Indian rule in Kashmir, condemned the detentions of its activists and said the action would only harm the Kashmir freedom struggle. Earlier, it said the Mujahideen, or holy warriors, would not accept the ban. 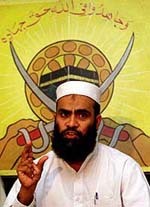 An Al-Badar Mujahideen statement pledged the group would continue with its jehad to fight Indian rule in Kashmir. India accuses Pakistan of backing the rebels in the disputed Himalayan region — a charge Pakistan denies, saying it only provides moral and diplomatic support to the separatists. Pakistani militants are also known to have operated in support of Muslim fighters in Afghanistan, Bosnia, Chechnya and the Philippines. Islamabad has also stepped up a drive against widespread illegal weapons and mounted a campaign against the rising levels of crime. Meanwhile, unhappy with a ban on public fund raising and advertising ‘jehad’ campaign, militant outfits operating from Pakistan have asked President Pervez Musharraf to explain Islamabad’s official policy on their “fight” in Kashmir. The militant groups said ‘jehad’ was not a philosophy or ideology but an Islamic duty and one should be free to perform it in Pakistan. The army-led Sindh Government had yesterday told ‘jehadi’ groups, including those fighting in Kashmir, to stop public fund-raising, displaying weapons and advertising their campaign. Its leaders told newspapers here yesterday that the groups fighting in Kashmir were not involved in any anti-Pakistan activity. Three of the bullet-riddled bodies were recognised while the fourth was taken away by the Israelis, they said. The clash took place at dawn when an Israeli elite unit surprised a group of Palestinian activists about to plant a bomb near Shavei Shomron settlement, an Israeli military source said. Nablus Governor Mahmoud el-Alul said on Palestinian radio that the incident started when a Palestinian was wounded by Israelis overnight near Beit Ila and Israeli soldiers opened fire again when one of his comrades tried to help him, killing the four Palestinians. The deaths bring to 731 the total number killed since the intifada or uprising started on September 28 last year. JERUSALEM: Israeli Prime Minister Ariel Sharon today insisted on a week of calm before implementing an internationally backed peace plan. “We have not given up on this test period of seven days, which was agreed with US Secretary of State Colin Powell,” Mr Sharon said in a statement after meeting German Foreign Minister Joschka Fischer, who is on a three-day mission to revive the moribund peace process. Switzerland offered to host a meeting between the Israelis and Palestinians, a Swiss government spokesman said, but no formal reply has been received. Mr Sharon has insisted that the Mitchell peace plan, seen by the international community as a roadmap to end the 11-month conflict, cannot be implemented until all violence has halted. “At 12 noon today, the North Atlantic Council agreed to issue the execution directive authorising the Supreme Allied Commander Europe, General Joseph Ralston, to release the activation order for Operation ‘Essential Harvest’,’’ a NATO statement said. The 19 countries of the Atlantic alliance had until noon to register any objections to the operation, which envisages the deployment of 3,500 NATO troops across the tiny former Yugoslav republic to collect the guerrillas’ weapons. None did, so the operation will go ahead. SKOPJE: A NATO operation to collect weapons from ethnic Albanian rebels in Macedonia was set to get under way despite a last-minute “provocation” when a 14th century Orthodox church was bombed. The bombing failed to prevent NATO ambassadors in Brussels from giving the green light yesterday to the operation, if none of the allies objected. A NATO spokesman in Brussels said the 19 ambassadors — the North Atlantic Council, or NAC — agreed on the so-called “silence procedure” after hearing a report from the Supreme Allied Commander for Europe, US General Joseph Ralston, that the conditions for Operation Essential Harvest had been met. Reformers had attacked many of Khatami’s Cabinet nominees as being lack-lustre and mediocre. They wanted the mild-mannered President to capitalise on his June election landside and name a more outright reformist Cabinet. “I chose them because of their high ability in management, besides which they are followers of the Islamic system and have the ability to work together,” Khatami told The Majlis in a speech defending his choices ahead of the vote. Many MPs swung in behind the President during the marathon debate which began on Sunday, after reformist party chiefs called them into line. Some conservative MPs are also thought to have backed Khatami fearing a more radical Cabinet if his nominees were rejected. Meanwhile, President Khatami today announced that first Vice-President Hassan Habibi had resigned from his post and would be replaced by Mohammad-Reza Aref. Habibi, a former Justice Minister in the 1980s and Vice President under former President Ali Akbar Hashemi-Rafsanjani, was named Vice-President by Khatami in 1997. Aref, (60), has a doctorate in telecommunications from Stanford University in the USA and is currently Director of the Plan and Budget Organisation. Mr Bolton said this after holding two-day talks with Moscow officials, in an interview to a Russian radio, to be aired this evening, the New York Times reported today. Mr Bolton is the first member of the Bush Administration to set a deadline for consultations before acting on his campaign to develop a new national missile defence system, the newspaper said. Mr Bush had pledged to consult with US allies, with Russia and China before withdrawing from the treaty. “Yesterday, during an operation by military intelligence, we have information that Shamil Basayev was injured. We are checking the information and also think that six of his personal bodyguards were killed,” Alexei Kuznetsov, Deputy Commander of the Russian forces in North Caucasus, told NTV television. Basayev gained notoriety in 1995 when he seized a hospital in the southern Russian town of Budennovsk. More than 100 people died during the siege and Basayev escaped unharmed. He lost part of a leg in a mine field while withdrawing from Grozny early last year and is still a talismanic figure for the rebels. Itar-Tass news agency quoted military sources as saying 13 rebels had been killed when troops engaged a group of about 30 guerrillas in southern Chechnya. Two more died during a separate military operation and a further seven were killed when helicopters destroyed two of their camps, Tass added. The Interior Ministry press centre said nine rebels had been killed after being caught planting explosives in Grozny and the town of Nozhai-Yurt, RIA news agency reported. A Chechen rebel website said guerrillas had suffered only a handful of casualties but killed about 50 Russian soldiers in the last few days. Director-General of the United Nations Educational, Scientific and Cultural Organisation (Unesco) Kochiro Matsuura said he had sought cooperation from two Arab organisations to rope in the Taliban leadership to attend a meeting of Islamic religious leaders to be organised by Unesco later this year. The US debt to the United Nations has reached a record high of $ 2.33 billion as of July 31, the world body reported. About $ 1.8 billion of the total is for peacekeeping missions for 2001 and in past years. The balance is Washington’s share of the UN’s regular $ 1.1 billion annual administrative budget, UN spokesman Fred Eckhard said. Even the $ 582 million which the US Senate promised to pay this year has been held up the House of Representatives. Conservatives are seeking to attach the funds to a Bill that bars American cooperation with a new International Criminal Court.” The House measure would demand parties to the court, which include all of NATO and other allies of the USA, exclude US servicemen from any prosecution. UN Secretary-General Kofi Annan has said Washington would undermine its effectiveness at the United Nations if it does not pay the promised funds ahead of this September’s General Assembly session.